Which 2011 playoff teams are most likely to fall short? Published: June 26, 2012 at 04:18 p.m. 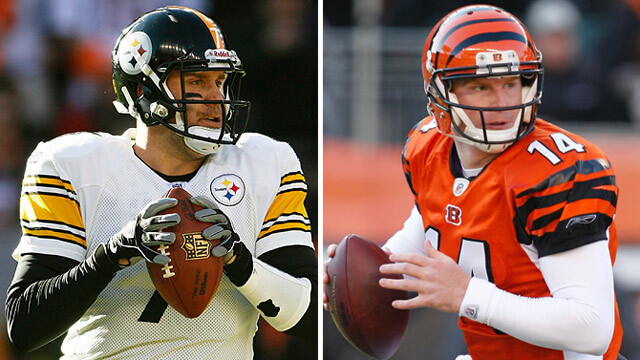 Updated: Sept. 26, 2012 at 01:27 p.m.
Ben Roethlisberger (left) and Andy Dalton led their teams to the playoffs last season. Can they repeat in 2012? It's not easy getting back. For well over a decade, we've seen roughly six playoff teams fail to make the postseason the following year. Those are ugly numbers, but they aren't surprising. Injuries, jacked-up expectations and tougher schedules take a toll. And when the bar-room lights are flipped on, last year's darlings often reveal their flaws. Six teams change every year, so choosing fewer would seem like a cop-out. The 49ers, Bengals and Lions are classic surprise teams that will learn a second act is much tougher. The Broncos have a brutal schedule and a lot of roster holes despite adding Peyton Manning. The Falcons and Giants easily could finish third in their own divisions. Part of me wants to be "Unlikable Contrarian Guy" and just say all 12 of last year's teams will stun the football world by re-qualifying. But that won't happen. The Saints' calamitous offseason will lead to a slow start that will sink them, while the Lions and Bengals will learn it's not easy to play with the burden of expectations. And take pity on the Suggs-free Ravens, who will watch Ray Lewis and Ed Reed lose a battle with Father Time, then realize once and for all that Joe Flacco isn't El Hombre. The Bengals haven't nailed back-to-back playoff appearances since Ronald Reagan slept in the White House. Don't hold your breath. The AFC North will eat itself up this time around, and that's where my Steelers pick comes from. In Denver, the hype doesn't make up for the holes. The Lions, meanwhile, already have been handed a playoff berth by experts, but don't forget how the Bears were 7-3 before Jay Cutler took a dirt nap. The Falcons, honestly, have lost their postseason privileges. As our fearless editor pointed out, there's been considerable turnover in the playoff picture from year to year. There's no rule preventing more than six teams from returning to the playoffs, though, so I'll go with five. In the AFC, Pittsburgh's young offensive line and the purging of veteran leaders hurts. It's never smart to bet against Peyton Manning, but the AFC West is wide open, and I like what I see in San Diego and Kansas City. The Giants were 7-7 at one point last season and took hits in free agency. The 49ers and Falcons might have a hard time staving off improved division opponents. We've probably upset a few of you. Tell us about it below.